A software update remarkably seems to make a tool less able to do something that it seemed to handle well before? I was recently strongly encouraged to apply a software update to my QuickBooks Pro 2014 software, for reasons of an important security update… yet afterwards I suddenly found out that the software I had successfully been using on Windows 10 for many months was suddenly incompatible? 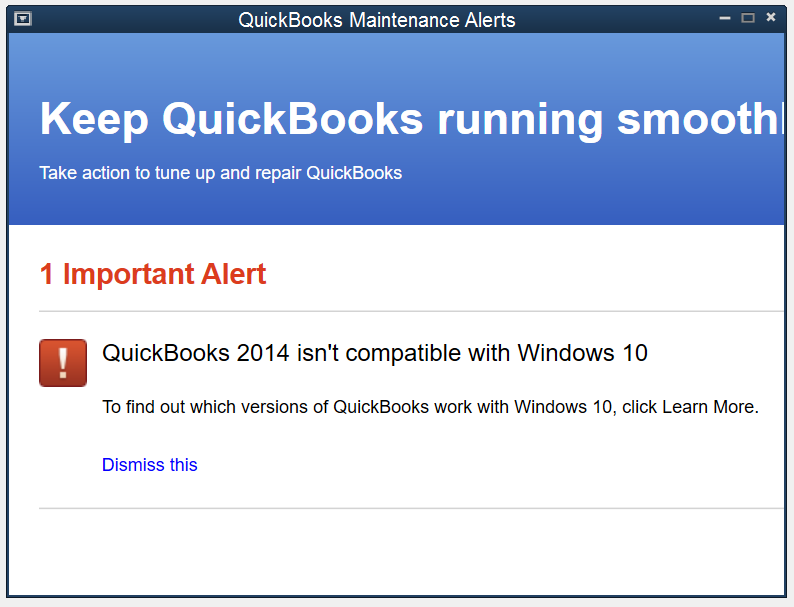 I do of course understand that technically Quickbooks may not have supported Windows 10, but to be so blatantly informed of this many months after one has been working on the other seems wrong, especially when it is the result of a software update supposedly including security. You may also note, what with the text that is cropped by the window, that QuickBooks Pro 2014 really does struggle with high definition displays… but I have yet to have a helpful notification about that from QuickBooks. Such an elusive message, what might it say? The heading runs off the screen, but luckily the body of the message can be seen in full… but ironically defeat is again snatched from the jaws of victory by there actually being no ‘Learn More’ link on the dialog! I must say that I have successfully continued to use the software without further nagging… but this blatant appeal (presumably to get a paid upgrade to the software) with such a lack of finesse and polish lowers my opinion of QuickBooks… and my opinion lowers even more when I consider it comes after an update that was supposedly intended to improve security. This entry was posted in Computing and the Web. Bookmark the permalink.